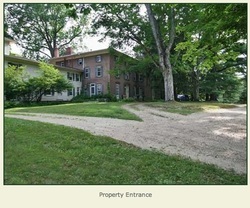 The entrance is a long, gravel semi-circular path wide enough to accommodate horse-drawn carriages. In the 1800's, fashionable houses were "mortared" to prevent vines from growing into the brick. Governor Holley not only designed his house, he took an active part in its construction. His diary entry for Sept 7, 1852: "Today I commenced coloring my house by mixing Ohio paint with the third coat of mortar made of gravel." Front entrance. In 1915, "modern" front door replaced double originals stored in the basement. 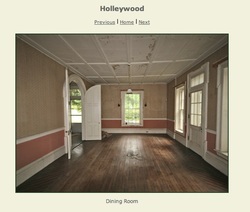 See the brass thing in the center of the dining room floor? A still-working foot buzzer. For calling the maid. 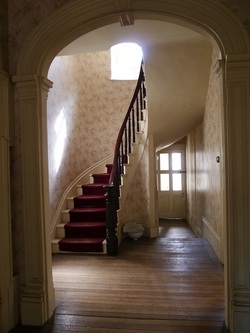 In 1860, the spiral stairs in front entry hall were moved at great expense to the back of the house. Front parlor where spinet piano once stood. Living room, when it was furnished. Lake-facing living room lit by tall casement windows with working accordian shutters. Four bedrooms on second floor are separated by wide center hallway. Door on right leads to service wing. The master bedroom includes hexagonal sitting room and Juliet balcony. This bedroom was enlarged in 1860 to include walk-in closet and windowed sitting area. 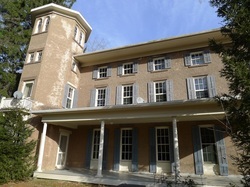 The side porch was replaced in 2009. The shutters are original but in excellent shape. The seller provided a house plan hand-drawn by his engineer father, identifying proper placement of all 97 window screens and shutters. Stairs leading from top of turret are steep and narrow. Feet were smaller in the 1800s. 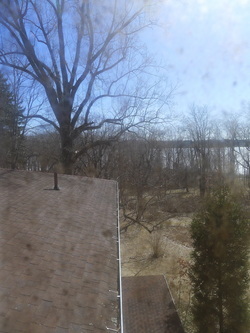 View of lake from turret window. 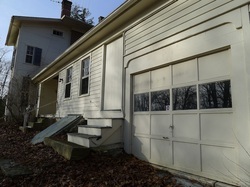 There's a two-car garage, but this isn't it. This is a tractor shed. Complete with coal bin and milk storage. Outbuildings include a cabin by the lake and this gatehouse at the entrance, built about the same time as the house. Cabin by the lake is in disrepair, apparently a teen hangout. But cabin interior's beautiful wood beams have survived time and teens.